To jump to the plain text of this reveiw, click here. 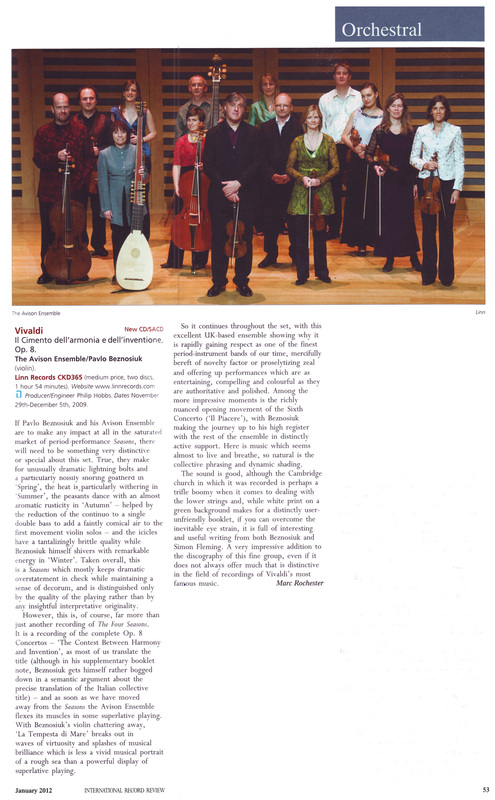 If Pavlo Beznosiuk and his Avison Ensemble are to make any impact at all in the saturated market of period-performance Seasons, there will need to be something very distinctive or special about this set. True, they make for unusually dramatic lightning bolts and a particularly noisily snoring goatherd in 'Spring', the heat is particularly withering in 'Summer', the peasant dance with an almost aromatic rusticity in 'Autumn' - helped by the reduction of the continuo to a single double bass to add a faintly comical air to the first movement violin solos - and the icicles have a tantalizingly brittle quality while Beznosiuk himself shivers with remarkable energy in 'Winter'. Taken overall, this is a Season which mostly keeps dramatic overstatement in check while maintaining a sense of decorum, and is distinguished only by the quality of the playing rather than by any insightful interpretative originality. However, this is, of course, far more than just another recording of The Four Seasons. It is a recording of the complete Op.8 Concertos - 'The Contest Between Harmony and Invention', as most of us translate the title (although in his supplementary booklet note, Beznosiuk gets himself rather bogged down in a semantic argument about the precise translation if the Italian collective title) - and as soon as we have moved away from the Seasons the Avison Ensemble flexes its muscles in some superlative playing. With Beznosiuk's violin chattering away, 'La Tempesta di Mare' breaks out in waves of virtuosity and splashes of musical brilliance which is less a vivid musical portrait of a rough sea than a powerful display of superlative playing. So it continues throughout the set, with this excellent UK based ensemble showing why it is rapidly gaining respect as one of the finest period-instrument bands of our time, mercifully bereft of novelty factor or proselytizing zeal and offering up performances which are as entertaining, compelling and colourful as they are authoritative and polished,. Among the more impressive moments is the richly nuanced opening movement of the Sixth Concerto ('Il Piacere'), with Beznosiuk making the journey up to his register with the rest of the ensemble in distinctly active support. Here is music which seems almost to live and breathe, so natural is the collective phrasing and dynamic shading. This sound is good, although the Cambridge church in which it was recorded is perhaps a trifle boomy when it comes to dealing with the lower strings and, while white print on a green background makes for a distinctly user-unfriendly booklet, if you can overcome the inevitable eye strain, it is full of interesting and useful writing from both Beznosiuk and Simon Fleming. A very impressive addition to the discography of this fine group, even if it does not always offer much that is distinctive in the field of recordings of Vivaldi's most famous music.